In this convincing trick, the magician shows an envelope and explains that there is a prediction written within. The spectator is given a deck of cards and is asked to mix it and deal cards (face down) onto the table until they feel like stopping. 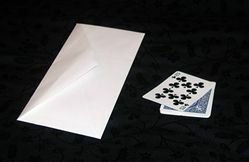 When the letter inside the envelope is read, it states the exact card that the spectator last dealt onto the table. A deck of cards, an envelope and a piece of paper. Write the name of a card on the paper. For this example, we'll be using the ten of clubs. Fold the paper and place it into the envelope. Close the envelope. You may seal it if you wish. Remove the card that's written on the paper (ten of clubs) and place it underneath the envelope. Rest the envelope on the table and arrange the card so it's easy to grab when you lift-up the envelope. This is the secret. After mentioning that an envelope is sitting on the table in plain view, ask the spectator to mix the deck and then deal cards, one by one, onto the table. Tell the spectator to stop dealing when he feels like it. Emphasize that the spectator could have stopped anywhere he wanted. Lift the envelope with the card underneath it and rest it on the pile of cards. Don't show the bottom of the envelope or you'll give away the secret. This places the card, the ten of clubs, on top of the pile that's on the table. The spectator will think that the top card was a result of him mixing and dealing the cards. But you have just placed a new card, the card written on the paper in the envelope, on top of the pile. Ask the spectator to remove the envelope and to turn over the top card on the pile. It will be the card that you secretly placed there. Ask the spectator to open the envelope and read the paper, which will state his card. The spectator may examine all of the props because there will be nothing to find.